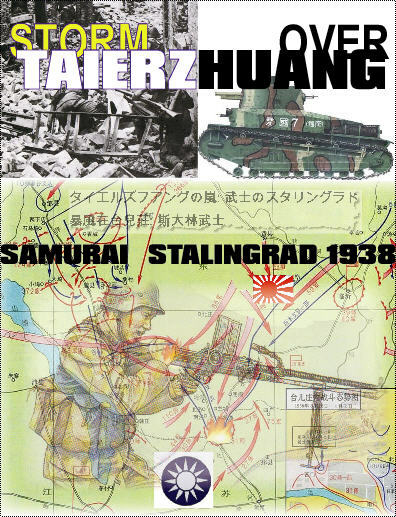 On January 26, 1938, the Japanese launched their offensive towards Xuzhou and by the evening of March 24, 1938, the Japanese 10th division (with around 25,000 men and around 100 tanks and armored cars) had reached the Taierzhuang area. The Japanese hadconquered huge swathes of Northern and Eastern China and were steadily pushing deeper into China. With the conquest of Shanghai, Beijing, and Nanjing in 1937, Jiang Jie Shi (Chang Kai Shek) had moved his headquarters to Wu Han. The Japanese seeing an opportunity struck to capture the important rail junction of Xuzhou endangering Wu Han and forcing a Chinese capitulation. The KMT generals also saw an opportunity to lure Japanese forces into a cul-de-sac and then encircle them with numerically superior Chinese forces. The town of Taierzhuang was chosen as the site for this trap as it was an important rail terminus on the way to Xuzhou. What followed is sometimes known as the "Samurai Stalingrad", as huge amounts of forces fought over a small town. This scenario has been repeated many times hence, at Ponyri Station, July 1943, at Stalingrad 1942, at Hue, 1968, and so on. The Chinese "lure" was fed by Japanese arrogance and bravado in their attitude of their invading army. To them, they were supreme over all others. The Russian volunteers played a key role in their support of providing pilots for the Russian I-15, I-16 aircraft. Ironically, the Chinese forces were armed with and odd mix of German and non-German weapons. SCALE: Each turn is one day for a total of 13 turns. Each area (no hexes) on the map is a half kilometer. Units are battalion size.